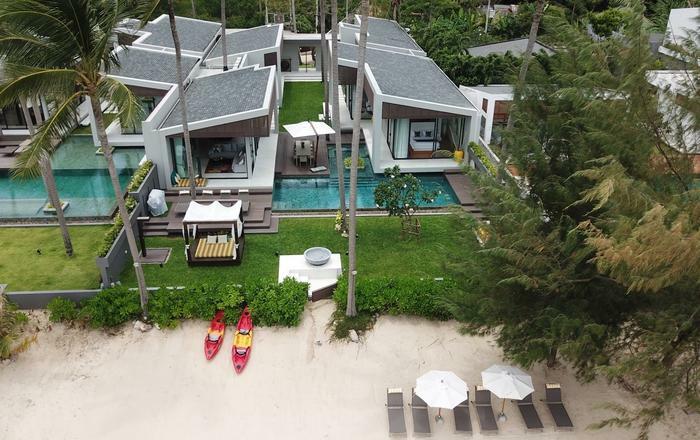 "20% off all stays until Dec 17 for new booking made in January only based on both full and reduced occupancy rates"
Live the high life at this gorgeous 6-bedroom (plus bunkroom) Koh Samui villa. You'll love having direct beach access, nearly as much as having a private pool, an in-house chef, and a south-facing location offering dreamy sunrises and sunsets. The villa is split between three pavilions, with a stunning kitchen, multiple open living spaces, and large bedrooms with en-suite bathrooms. Complimentary Wi-Fi and Netflix also included. Sleeps 12 adults and 3 kids. 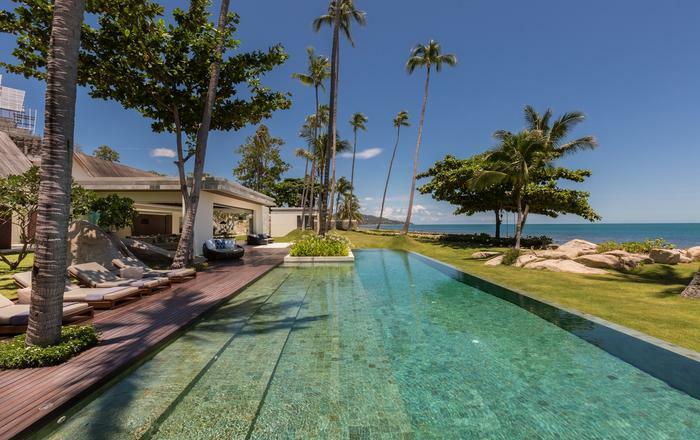 This luxury villa combines contemporary style with an idyllic beachfront setting, while an open design invites the warm ocean breeze into every room. Slip on your flip flops and stroll across the villa's luscious garden to the private pool. Grab a book and claim a sun lounger. Or swoon over the ocean views in a poolside sala with plush sofas and a wooden dining table. 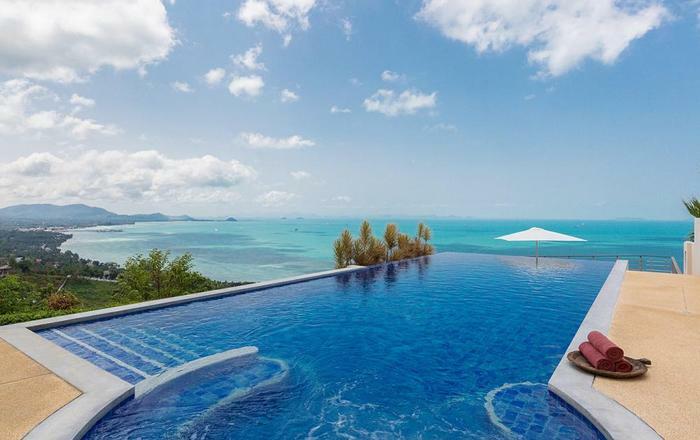 With a south-facing location, you'll never miss one of Samui's million-dollar sunrises and sunsets. Head inside the main pavilion to enjoy the shade and group chill-out time. 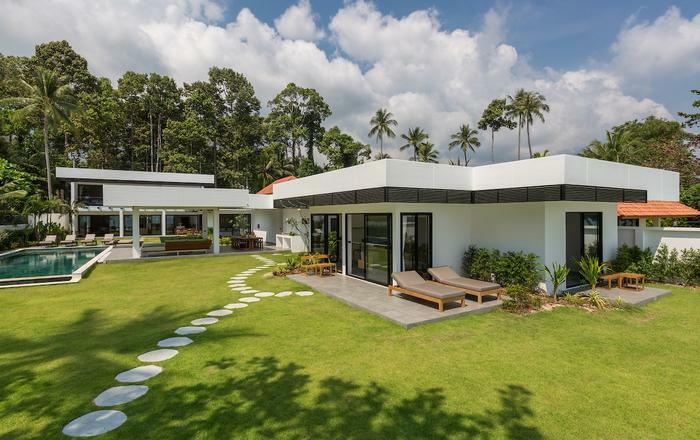 Whip up a round of drinks in a sleek all-white guest kitchen, and gather for meals prepared by your in-villa chef at a large blonde wood dining table. After dinner, the grownups can chat while the kids watch movies with popcorn in the spacious TV lounge. An extra lounge/library offers a tucked-away spot for privacy. When you're ready to slumber, the villa offers six stylishly appointed bedrooms and a bunk room. Open your eyes to ocean views from either of the two king-size bedrooms - located on the upper level of the main pavilion. Another upper-level bunk room, complete with TV and three twin beds, is where the little ones can laugh and giggle in true slumber-party fashion while you let the waves lull you to sleep. Then reunite for mornings in the sun on a sprawling balcony that connects all three bedrooms. The garden pavilion has two generously sized bedrooms, each with king beds and their own terrace. The final two bedrooms await in the beachfront pavilion, both of which have king beds and a private terrace. This pavilion is perfect for families with little ones - offering a TV room, and a small kitchenette for whipping up beach snacks and easy lunches. All adult bedrooms have an en-suite bathroom with a rain-head shower, and the kid's bunk room has an adjacent bathroom. Whether you unwind with cold cocktails or vinyasa flows, you’ll find relaxation at your fingertips. Beach bars, restaurants, convenience shops, and a yoga retreat are all within walking distance. The islands of Koh Mudsum and traffic-free Koh Taen are only a 20-minute long-tail boat ride away from the fishing village of Thong Krut - just a 5-minute drive from the villa. You'll also find several temples within a short drive, including Wat Khunaram (home to the Mummified Monk), and glittering Laem Sor Pagoda. Amazing location and fantastic staff! Very good and perfect spot for family gathering. Love it very much and the entire family had a great time. Would definitely recommend to others. This is a big villa! It's so beautiful. Breakfast is very big here. Of course fried shrimp is also delicious! It's comfortable here and I liked it very much! Very peaceful and beautiful villa. Staff are very nice, friendly and kind. We had a wonderful holiday! Next time, I will choose this villa to stay. Thank you so much! Our stay in villa thansamaay was a big surprise for us. We never tought A luxury Holliday could be like that. The service of the staff was amazing. Even the food from the chef was so delicious. The spacious garden with easy to access swimming pool was one of the reasons why we booked this villa.We hope to come back in the future. 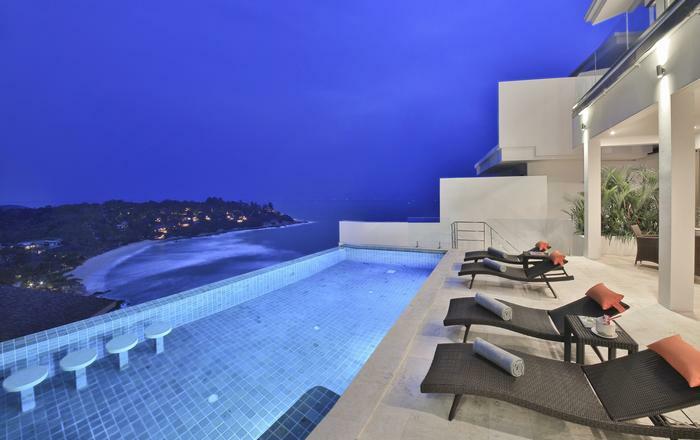 Overall, we can recommend this villa. We had a great time at villa Thansamaay! We appreciated the friendly staff who was invisibly present at all times. Service was perfect, with eye for detail. We really loved the tropical and spacious garden. A perfect playground for the kids. We only missed some beach chairs but this was taken care of immediately. Thumbs up for the team. 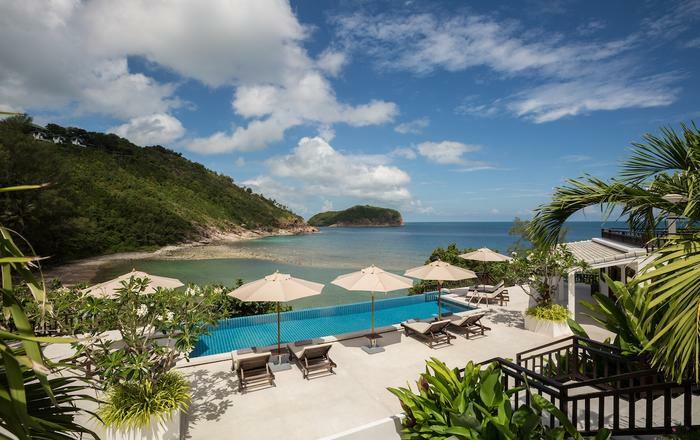 Although only opened very recently, we can only recommend the villa to people looking for a peaceful beach holiday. We stayed in the villa with the whole family during three weeks. We had a wonderful time. The villa was very new and with all comfort. The staff was excellent, very discrete and very helpful. I can really recommend this accommodation! Shopping Service: Prior to your arrival we will send you a food and wine shopping list allowing us to stock the villa with your favourites foods and beverages (on guest's account). To confirm a booking we require a 30% deposit and the balance is due at least 45 days prior to arrival. Payment can be made either by bank transfer or on-line by credit card (surcharge applies).